Regular expressions can become quite complex. The lack of white space makes them difficult to read. I can't step though a regular expression with a debugger. So how do experts debug complex regular expressions? You buy RegexBuddy and use its built in debug feature. If you work with regexes more than twice a year, you will make this money back in time saved in no time. RegexBuddy will also help you to create simple and complex regular expressions, and even generate the code for you in a variety of languages. Also, according to the developer, this tool runs nearly flawlessly on Linux when used with WINE. Matching REx "(. )\1" against "foobar"
Also, you can add whitespace and comments to regexes to make them more readable. In Perl, this is done with the /x modifier. With pcre, there is the PCRE_EXTENDED flag. pcre *pat = pcre_compile("(.) # any character, followed by a\n"
Its perfect for quickly testing where something is going wrong. Kodos is a Python GUI utility for creating, testing and debugging regular expressions for the Python programming language. Kodos should aid any developer to efficiently and effortlessly develop regular expressions in Python. Since Python's implementation of regular expressions is based on the PCRE standard, Kodos should benefit developers in other programming languages that also adhere to the PCRE standard (Perl, PHP, etc...). Runs on Linux, Unix, Windows, Mac. I think they don't. If your regexp is too complicated, and problematic to the point you need a debugger, you should create a specific parser, or use another method. It will be much more readable and maintainable. There is an excellent free tool, the Regex Coach. The latest version is only available for Windows; its author Dr. Edmund Weitz stopped maintaining the Linux version because too few people downloaded it, but there is an older version for Linux on the download page. But yeah, it can't beat RegexBuddy. I debug my regexes with my own eyes. That's why I use /x modifier, write comments for them and split them in parts. Read Jeffrey Friedl's Mastering Regular Expressions to learn how to develop fast and readable regular expressions. 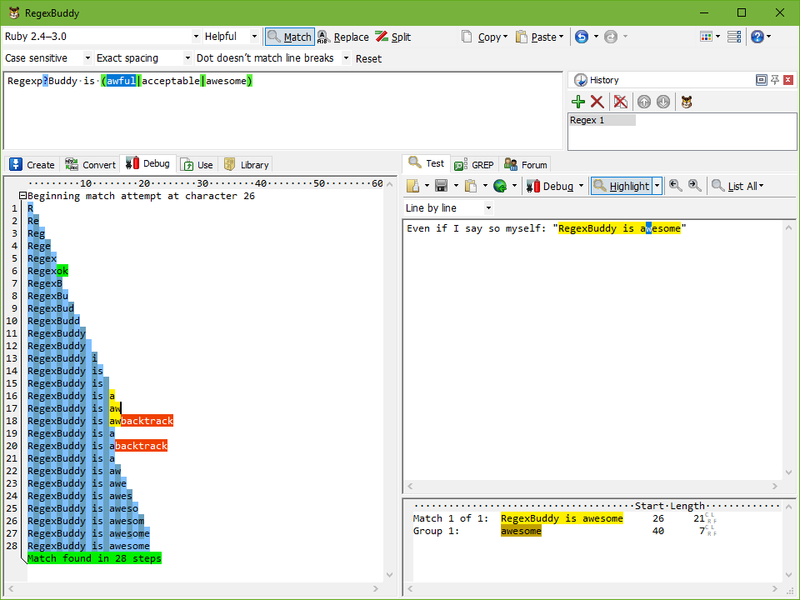 Various regex debugging tools just provoke voodoo programming. If I'm feeling stuck, I like to go backward and generate the regex directly from a sample text using txt2re (although I usually end up tweaking the resulting regex by hand). It's free, and simple to use, and it's been a great help for me to get to grips with RegExs in general. Have a look at the (non-free) tools on regular-expressions.info. RegexBuddy in particular. Here is Jeff Atwood's post on the subject. Writing reg exes using a notation like PCREs is like writing assembler: it's fine if you can just see the corresponding finite state automata in your head, but it can get difficult to maintain very quickly. The reasons for not using a debugger are much the same as for not using a debugger with a programming language: you can fix local mistakes, but they won't help you solve the design problems that led you to make the local mistakes in the first place. The more reflective way is to use data representations to generate regexps in your programming language, and have appropriate abstractions to build them. Olin Shiver's introduction to his scheme regexp notation gives an excellent overview of the issues faced in designing these data representations. I often use pcretest - hardly a "debugger" but it works over a text-only SSH connection and parses exactly the regex dialect I need: my (C++) code links to libpcre, so there's no difficulty with subtle differences in what's magic and what isn't, etc. In general I agree with the guy above to whom needing a regex debugger is a code smell. For me the hardest about using regexes is usually not the regex itself, but the multiple layers of quoting needed to make them work. I use the Rx Toolkit included with ActiveState Komodo. For me, after having eyeballed the regex (as I'm fairly fluent, and nearly always use /x or equivalent), I might debug rather than test if I am unsure if I would hit some degenerate matching (i.e. something that excessively backtracks) to see if I could solve such issues by modifying the greedyness of an operator for example. To do that, I'd use one of the methods mentioned above: pcretest, RegexBuddy (if my current workplace has licensed it) or similar, and sometimes I time it in Linqpad if I'm working in C# regexes. Not the answer you're looking for? Browse other questions tagged regex debugging pcre or ask your own question. How can I prevent Visual Studio 2013 from closing my IIS Express app when I end debugging?